A PCC meeting was held at Rose Cottage, Brooke on Monday 23rd October when we were very pleased to welcome Julie back to chair the meeting which she opened and closed with a prayer. Items under discussion were yet again our parish share, fund raising suggestions for 2018, possible new members for the PCC and preparations for the Christmas Coffee morning. The maintenance of the church was reported to be in a good state and with, thankfully, no serious problems at the moment, approval from the DAC had been received for the memorial bench for Ken Grimmer and we all admired the website that Derek Harrington had been preparing for Brooke. Derek was thanked for his continuing work on the proposed additional web site and Sheila was thanked for coffee and hosting the meeting. The next PCC meeting will be at 6 Tay Close, Oakham on 21 st February 2018. A group of 21 members of the Ecclesiological Society had included St Peter on their recent tour of churches in Leicestershire and Rutland. Their visit on the afternoon of 23 rd October was much appreciated since they had made complimentary comments in the visitor’s book, bought cards, candles and jams as well as leaving money in the donations box. St Peter continues to welcome people from all over the country and globe, amongst others October saw groups of bell ringers from Somerset and East Kent, the Launde Walking Holiday group and visitors from California and Australia. Our Remembrance Service, taken by Julie and assisted by Philip was held on Sunday the 12 th November, we remembered the three local young men who gave their lives in WWl. They were Pte Stanley H Burfield 1885-1917, Dvr Herbert Molyneux 1885-1917 and Pte Joseph Royce 18 92-1915, who are all buried in ‘foreign fields’. 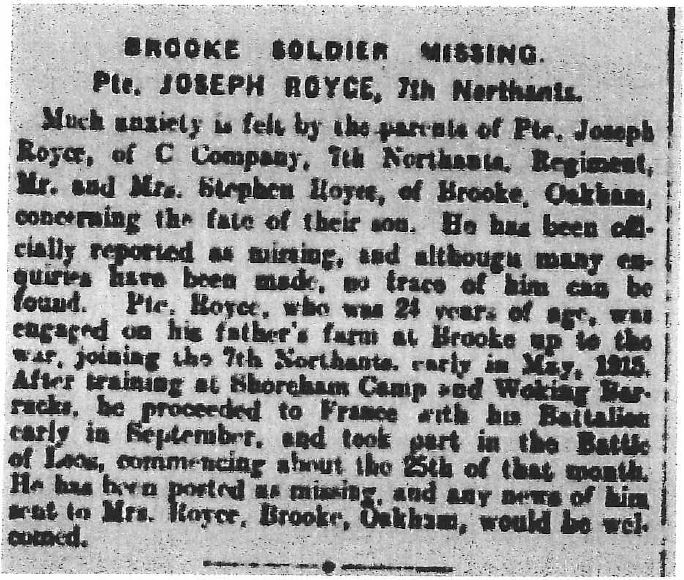 This article appeared in the Grantham Journal on 12th February 1916 although Pte Joseph Royce had been reported missing the previous September 1915. Christmas Day Service 25th December BCP at 8:00am.